Commanding Brig. 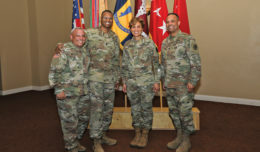 Gen. Jeffrey Broadwater and Command Sgt. Matthew Lowe Lowe present the Chief of Staff Award for Excellence in Legal Assistance to Jessaka Menzie, the Chief of Client Services, and Legal Office representatives. 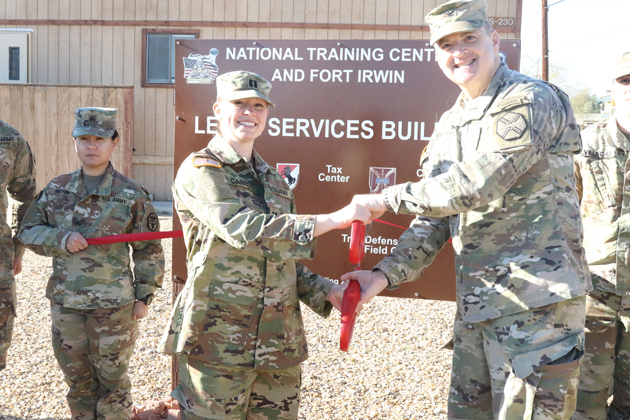 FORT IRWIN — The Tax Center on post celebrated its official open with a ribbon cutting ceremony, tour and treats, as the office hopes to prepare more than 1,000 tax returns at no cost to soldiers and their families. 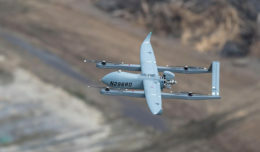 The center opened on Jan. 22 and will assist through April 18. The office can prepare up to five returns at a time and also has one quality reviewer. The Fort Irwin community booked 35 appointments in just one week and Cpt. Kathleen Carroll said many of their calendars are already very full. Most of the tax questions they receive are not complicated. 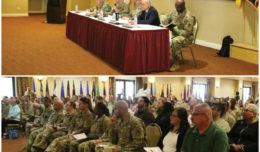 Last year the office brought in just under 1,200 clients and this year Garrison Commander, Col. Seth Krummrich, challenged the office to bring in more than 1,200. Col. Krummrich helped cut the ribbon for the grand opening of the Tax Center, followed by Commanding Brig. Gen. Jeffery Broadwater presenting the Legal Office with the Chief of Staff Award for Excellence in Legal Assistance. 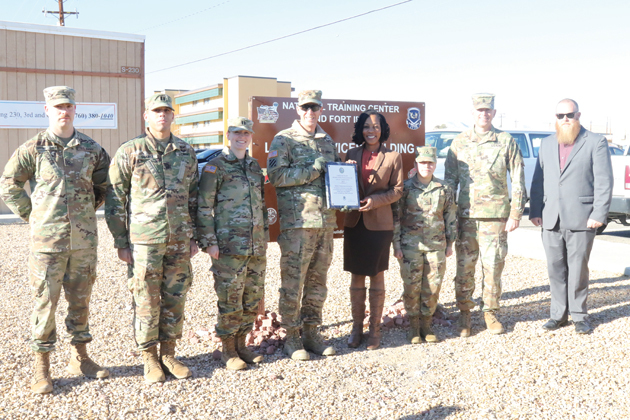 It’s an award given for superior achievement in providing professional legal advice and assistance to soldiers and their families on their personal legal affairs in need. Tax services are available to active-duty military personnel from all services (including Reserves and National Guard on orders for 30 days or more), military Retirees, and their dependents. “Our preparers are super excited to start working, they’ve had a ton of training. They’re trained by the IRS and the California Franchise Tax Board,” Carroll said. Contact the Tax Center for situations of which they are not available to assist. The Tax Center is located at Bldg. 230 and is operated by the Office of the Staff Judge Advocate, Legal Assistance Office. The hours of operation are every Monday through Friday, 8:30 a.m.-5 p.m.
Col. Seth Krummrich helps Legal Assistance Attorney Cpt. Kathleen Carroll cut the ribbon for the grand opening of the Tax Center for 2019.